The Potsdam Declaration was issued on 26 July 1945 in the name of the governments of the United States, the Republic of China, and the United Kingdom. 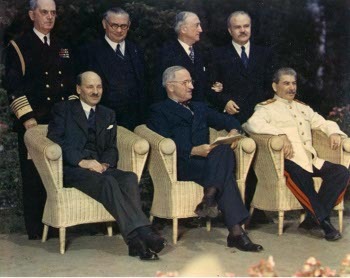 At the time, President Truman and Prime Minister Clement Attlee were meeting with Josef Stalin at Potsdam, Germany, to settle various issues related to the end of the war in Europe and to the demands by the western Allies for Russian intervention against Japan. The declaration was issued ten days after the United States detonated the first nuclear explosive at Alamagordo, New Mexico. Truman had written in his diary on the evening before issuing the Declaration that "we will issue a warning statement asking the Japs to surrender and save lives. I'm sure they will not do that, but we will have given them the chance" (Miscamble 2011). The indications are that Truman had already made the decision to use nuclear weapons against Japan, and he believed they would force a Japanese surrender: "Japs will fold up before Russia comes in. I am sure they will when Manhattan appears over their homeland." However, Truman continued to seek Russian intervention: "... I want 'em [Britain and Russia] both in it." Chiang Kai-shek was not present at the conference, but cabled his endorsement to Truman at Potsdam. Russia was not at war with Japan and was informed of the Proclamation at the same time as the rest of the world. However, one can speculate that the decision to issue the Declaration from Potsdam, where Stalin was known to have been meeting with the other Allied leaders, carried an implicit threat of Russian intervention. (1) We-the President of the United States, the President of the National Government of the Republic of China, and the Prime Minister of Great Britain, representing the hundreds of millions of our countrymen, have conferred and agree that Japan shall be given an opportunity to end this war. (2) The prodigious land, sea and air forces of the United States, the British Empire and of China, many times reinforced by their armies and air fleets from the west, are poised to strike the final blows upon Japan. This military power is sustained and inspired by the determination of all the Allied Nations to prosecute the war against Japan until she ceases to resist. (3) The result of the futile and senseless German resistance to the might of the aroused free peoples of the world stands forth in awful clarity as an example to the people of Japan. The might that now converges on Japan is immeasurably greater than that which, when applied to the resisting Nazis, necessarily laid waste to the lands, the industry and the method of life of the whole German people. The full application of our military power, backed by our resolve, will mean the inevitable and complete destruction of the Japanese armed forces and just as inevitably the utter devastation of the Japanese homeland. (4) The time has come for Japan to decide whether she will continue to be controlled by those self-willed militaristic advisers whose unintelligent calculations have brought the Empire of Japan to the threshold of annihilation, or whether she will follow the path of reason. (5) Following are our terms. We will not deviate from them. There are no alternatives. We shall brook no delay. (6) There must be eliminated for all time the authority and influence of those who have deceived and misled the people of Japan into embarking on world conquest, for we insist that a new order of peace, security and justice will be impossible until irresponsible militarism is driven from the world. (7) Until such a new order is established and until there is convincing proof that Japan's war-making power is destroyed, points in Japanese territory to be designated by the Allies shall be occupied to secure the achievement of the basic objectives we are here setting forth. (8) The terms of the Cairo Declaration shall be carried out and Japanese sovereignty shall be limited to the islands of Honshu, Hokkaido, Kyushu, Shikoku and such minor islands as we determine. (9) The Japanese military forces, after being completely disarmed, shall be permitted to return to their homes with the opportunity to lead peaceful and productive lives. (10) We do not intend that the Japanese shall be enslaved as a race or destroyed as a nation, but stern justice shall be meted out to all war criminals, including those who have visited cruelties upon our prisoners. The Japanese Government shall remove all obstacles to the revival and strengthening of democratic tendencies among the Japanese people. Freedom of speech, of religion, and of thought, as well as respect for the fundamental human rights shall be established. (11) Japan shall be permitted to maintain such industries as will sustain her economy and permit the exaction of just reparations in kind, but not those which would enable her to re-arm for war. To this end, access to, as distinguished from control of, raw materials shall be permitted. Eventual Japanese participation in world trade relations shall be permitted. (12) The occupying forces of the Allies shall be withdrawn from Japan as soon as these objectives have been accomplished and there has been established in accordance with the freely expressed will of the Japanese people a peacefully inclined and responsible government. (13) We call upon the government of Japan to proclaim now the unconditional surrender of all Japanese armed forces, and to provide proper and adequate assurances of their good faith in such action. The alternative for Japan is prompt and utter destruction. The Declaration was thus an ultimatum falling short of a demand for unconditional surrender, since it included guarantees that ordinary Japanese soldiers would not be interned indefinitely; that Japanese industry would not be eliminated and Japan would be given access to raw materials; and that the occupation would not be indefinite and the main Japanese home islands would eventually regain their sovereignty. In addition, the Declaration placed the blame for pursuing the war on "self-willed militaristic advisers" rather than the Emperor. While falling far short of guaranteeing the status of the Emperor as formal head of state in the postwar government, this assignment of war guilt at least suggested the possibility that the Emperor could be retained. One of the most common and important time factors in Japanese negotiations or discussions about serious matters was - and still is - the use of time gaps or breaks. Their people involved simply stop talking. They may just sit and remain silent (often with their eyes closed), get up and leave the room for short periods, or hold low-voiced side conversations with their colleagues. Japanese negotiators and others develop varying degrees of skill in using these time gaps to their own advantage - so much so that there is a special term used in reference to the process: mokusatsu (mohkuu-sahtsuu), which means "killing with silence". Mokusatsu refers to the idea of "killing" the other party's case or proposition by letting it die in the vacuum of silence. Suzuki later told his son that mokusatsu was meant to be equivalent to a Western "no comment" but there was no Japanese phrase carrying that precise meaning. On the other hand, Suzuki reportedly told a senior Cabinet official that "for the enemy to say something like that [the Postdam Declaration] means circumstances have arisen that force them also to end the war. That is why they are talking about unconditional surrender. Precisely at a time like this, if we hold firm, then they will yield before we do" (Miscamble 2011). The controversy over the meaning of mokusatsu reflects the wider controversy over whether Japan was already on the verge of surrender, making the use of nuclear weapons unnecessary.If mokusatsu meant merely that the Japanese Government was not prepared to make an immediate response, so the argument goes, then the nuclear attacks were a tragic mistake resulting from a mistranslation. However, the Allies had excellent cryptographic intelligence indicating that the Japanese military were rapidly building up their defenses in the areas targeted for Allied invasion. Although the Allies were aware that civilian elements in the Japanese government had attempted to open peace feelers through the Russians, they correctly judged that the Japanese military were still firmly in control and determined to fight on rather than accept unconditional surrender. The ultimate form of government of Japan shall, in accordance with the Potsdam declaration, be established by the freely expressed will of the Japanese people. The armed forces of the Allied powers will remain in Japan until the purposes set forth in the Potsdam Declaration are achieved. Contrary to myth, this was no guarantee of the Imperial institution, as the Americans would make clear early in the occupation. The Japanese nonetheless felt compelled to capitulate. The speech by the Emperor to his people announcing the end of the war avoided the use of the word "surrender" and simply stated that Japan was accepting the terms of the Potsdam Declaration. Since the Allies had dropped leaflets with the full text of the Declaration on Japanese cities, most of the Japanese people would have understood the implications of what the Emperor was saying. The Potsdam Declaration has been criticized for failing to include Russia among the concurring powers; for failing to explicitly threaten the use of nuclear weapons; and for failing to explicitly state that the Allies were prepared to allow the Emperor to remain as a constitutional monarch. It has been suggested that any of these additions to the Declaration would have led to its immediate acceptance by the Japanese. This seems unlikely. Russian concurrence in the Declaration would have amounted to an ultimatum, but the Russians meant to intervene at a time of their own choosing. Specific mention of the atomic bomb in the Declaration might have been interpreted as an empty bluff. Although the U.S. Secretary of War, Henry L. Stimson, argued for offering to allow the Japanese to retain their Emperor, Truman and Secretary of State James F. Byrnes felt that any guarantees regarding the Emperor were politically all but impossible, particularly in light of the desire for Russian intervention. Instructions to the Japanese ambassador in Moscow from the Japanese Foreign Ministry insisted on minimum terms of no occupation of Japan and Japanese control of any war crimes trials, in addition to preservation of the Chrysanthemum Throne. These terms were remarkably similar to those given Germany at the end of the First World War, and the Americans would have rejected them out of hand.